It's out. 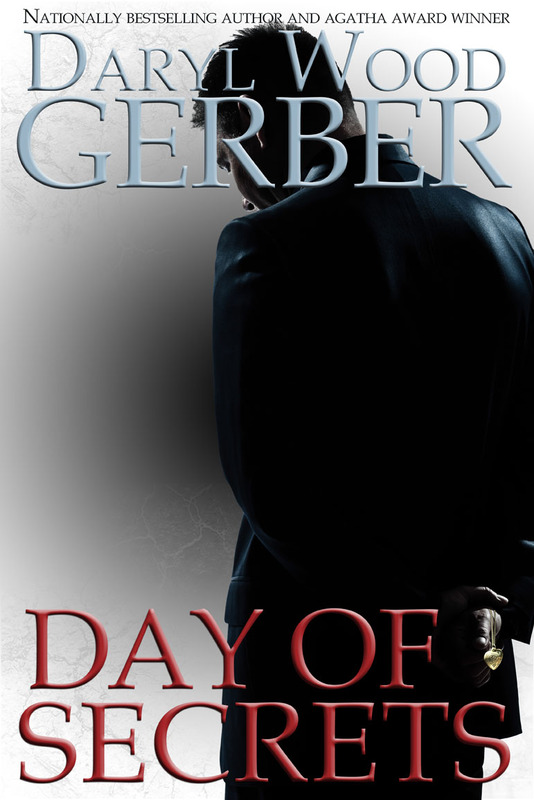 DAY OF SECRETS, my second stand-alone suspense, released last Friday. See below for some great reviews and the blurb and a giveaway. But first...one must eat, and I know my protagonist Chase Day would LOVE this meal! Grilled cheese, scrambled eggs, easy food are his kinds of foods. Comfort food. He needs comfort in this book. A cup of yogurt or scoop of cottage cheese just won't do it, know what I mean? I love grilled cheese sandwiches, as many of you know. 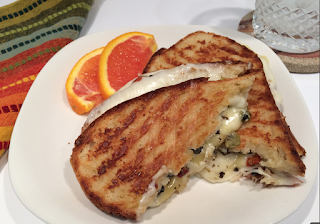 I've been making them for years, and even more because of writing the Cheese Shop Mysteries and then the second in the Cookbook Nook Mysteries, Inherit the Word, where it featured a grilled cheese cook-off contest! I've tried my hand at grilled cheese with apples, pears, shrimp, jam. There are so many things that taste great with cheese! 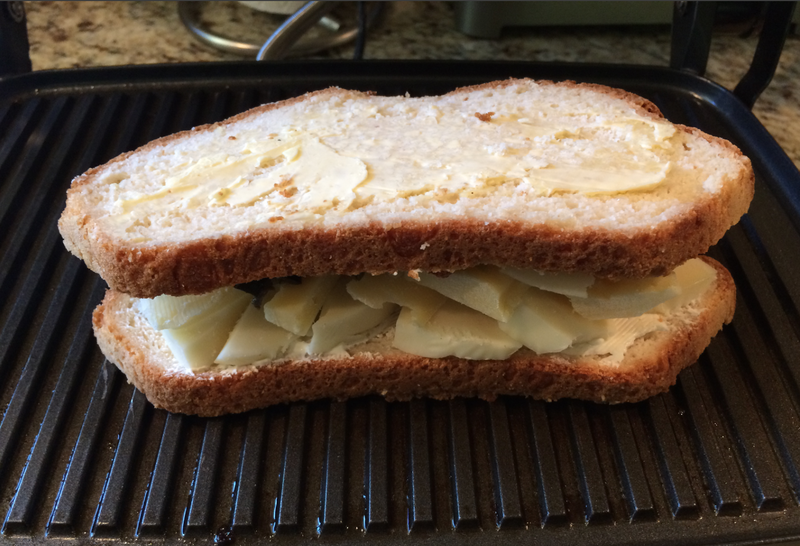 What I do have to admit is how much I love my panini maker. It really melts the cheese perfectly. Yes, over the years, I've cooked these delicious sandwiches on a grill or in a sauté pan, but sometimes the cheese didn't cook all the way through to where it oozed out of the sandwich. That's what is great. The oozing. 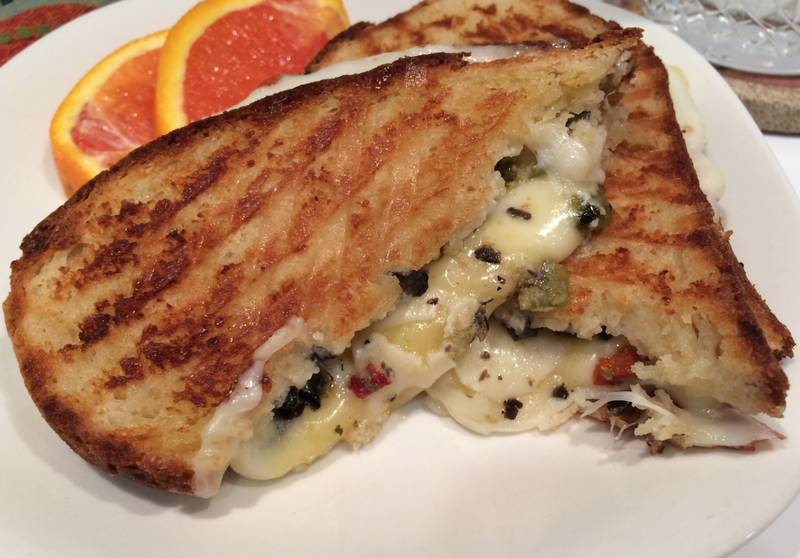 The panini cooks from both sides. Cheese oozes! The other thing I love about making these sandwiches is a tip I received from a cheese mavin a few years ago. She said to spread the inside of the bread with cream cheese. It helps the cheese melt, I think, because it acts like a "conductor." Don't quote me on that. No matter what, this is an easy recipe. 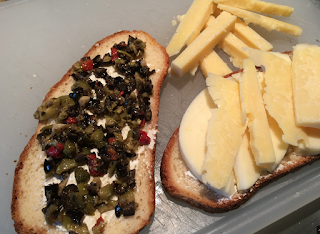 I used a jar of olive tapenade that I found at Trader Joe's. So delicious! I used a Panini maker. You can use a griddle or sauté pan. If using a Panini maker, turn it on right now, to heat up. Don't worry. It won't "burn." Meanwhile, butter the outside of the bread, using a tablespoon per sandwich. And then spread the cream cheese on the insides of the bread, using a tablespoon per slice. Top one slice with Mozzarella and white Cheddar. Top the other side of the bread that has cream cheese only with a large portion of olive tapenade (2-4 tablespoons). Put the sandwich together and press to secure. Slice in half diagonally and garnish the plate with orange wedges or serve with a crisp green salad. Back to my new release DAY OF SECRETS. As I said above, got your copy? And 50 plus more on Goodreads and Amazon! By the way, if you subscribe to my newsletter, you can see some very exclusive things in the Savor the Mystery Club on my website! Deleted scene, 2 live interviews, a photo journey and more! Sign up now. NEWSLETTER LINK. Also, if you missed my virtual release party, sorry. 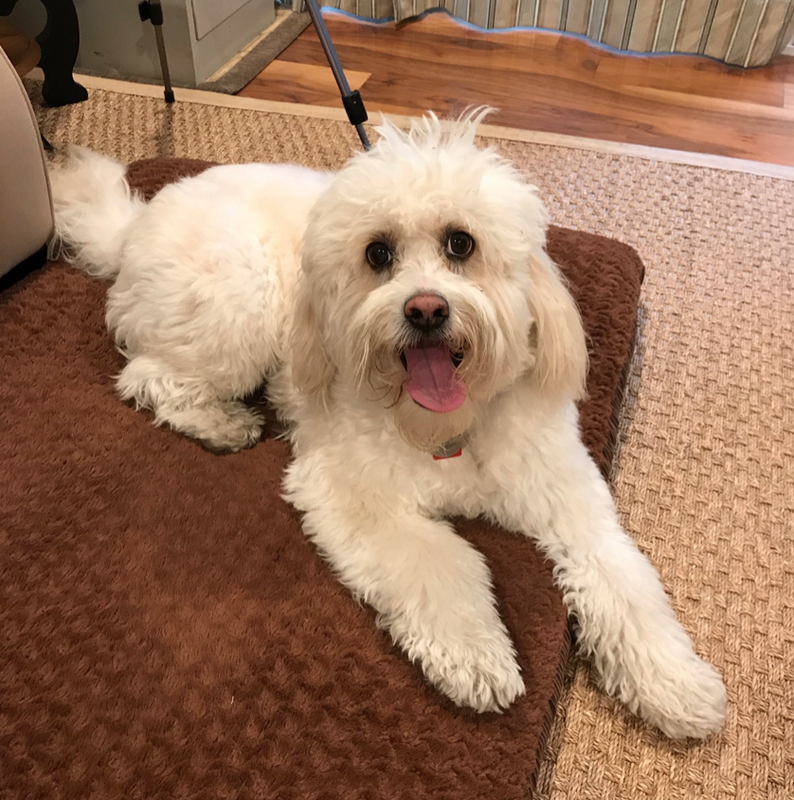 Sparky was there to say hi to everyone! Isn't he just the happiest greeter? 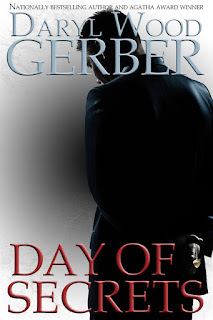 Leave a comment if you'd like to win a trade paperback copy or e-book copy of DAY OF SECRETS! Tell me if you've even heard about this book yet. From a friend? From me? From an ad? I'll pick the winner by tomorrow night. Leave your email so I can contact you.